DNA matches do not always respond to email messages. It’s the nature of the genealogy DNA game. One approach (and there are many) is to Google search the email address attached to the test kit. Recently when I did this, the search pulled up postings to the message boards at Ancestry.com associated with that email address. That lead me to the person’s Ancestry.com account which indicated that they had their DNA tests on that site. 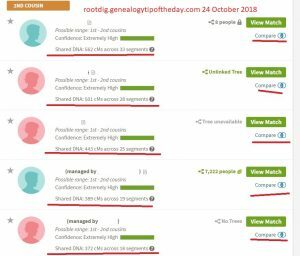 If the test at GedMatch has no GedCom file associated with it, you have no way of knowing who the testee was (unless the name of the test makes it clear). Remember that some people administer multiple tests, so knowing which one you really matched can be problematic. But it can be a start. ← Are All Your Cookie Necessities in the Fridge?